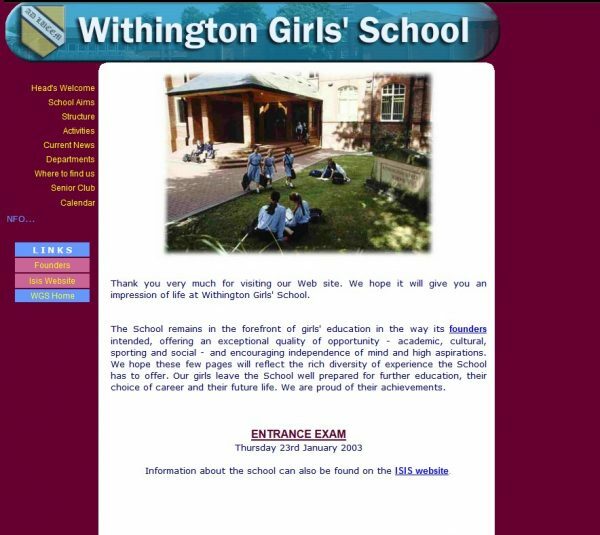 Withington pupils have shown a keen interest in technology and computing over the years. Records held within our archive collection document the advancement of ICT and how it has been used to perform different tasks, both in the classroom and office. In the 1966 School Newsletter, 6th Form Scientists went to the Free Trade Hall to hear the Faraday Lecture on Computers. Then, in 1968, Mary Almond, a former WGS pupil herself, gave a series of lectures at Manchester University to an audience consisting of a number of Withington pupils. The lecture series was titled ‘An Introduction to Digital Computers’. During the 1990s, the computers were used more and more for school activities, homework and events. 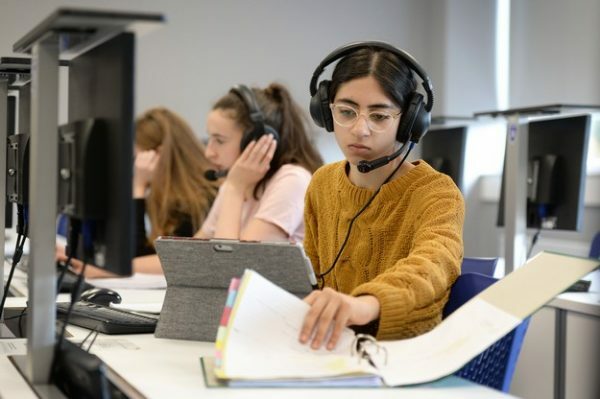 The ICT suite formed a compulsory part of the curriculum for Year 7 and 8 students and Information Technology formed a part of the General Studies carousel for Sixth Form Students. 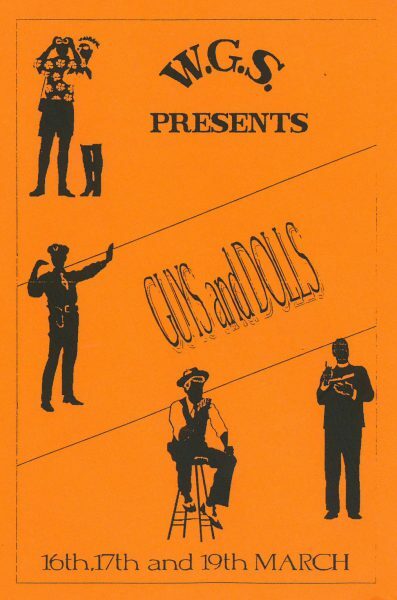 An interesting article was printed in the 1995 Newsletter written by an Upper Sixth student. It documents the advancement in equipment used in maths and physics lessons. Scientific calculators were new and changed the way mathematical problems were solved, transforming maths lessons. Dawn Craig’s article now draws a parallel to how we use our smart phones and devices today. ‘When I was in the first year, computers were the latest technological advancement, and I spent many a lesson writing programmes involving music and pictures, developing logic. Since then, programming has been replaced by the use of sophisticated software packages including graphics, word processing and spreadsheets. But now there is a new technology influencing maths classes. Wander into any G.C.S.E. or ‘A’ level lesson and taking pride of place on the girls’ desks, amongst the graph paper and textbooks, are their shiny grey Graphical Calculators. These calculators don’t just give you answers, they also show the calculations that are being performed and the screen displays graphs of parabolas or sine waves in seconds. For those of you who struggled with log tables we have admiration, we can only stand back in wonder and try not to laugh. Tablets and Scientific calculators in use today! The 1997 Newsletter documents how computers were increasingly used to improve communication in a quick and cheap manner. The article states that pupils and staff were enthusiastic users of emails and that ‘School sends about 80 emails a day, and receives the same number!’ Today, unsurprisingly, our emailing has increased in a huge way. Each day we are receiving over 4,200 emails and sending nearly 800! In 2000, our school had three main ICT teaching rooms to better enable the teaching of ICT at GCSE and A Level. As well as dedicated computer rooms, there were plans to provide individual computers at teaching desks in each classroom. 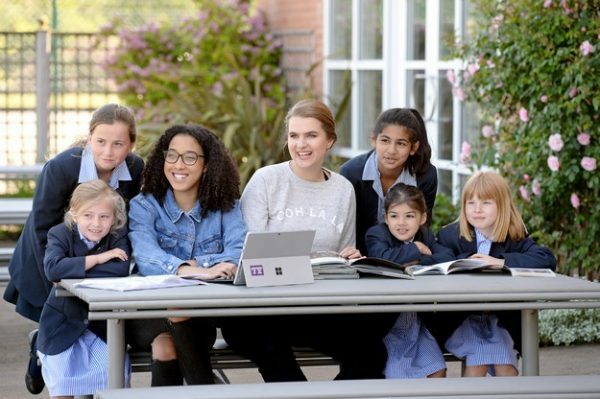 The 2000 Newsletter describes the networking of the whole School as the ‘most exciting event in the School Calendar!’ Following this, internet accessibility improved and four key Wifi access points were created in 2009. We now have 75 access points, even offering coverage out on the School field! The wireless connection is now almost 4000 times faster than the original internet connection! Pupils accessing the internet outside the Sixth Form Common Room! The number of computers that we have access to has also increased. In 2000, there were over 100 computers in use on the School site. 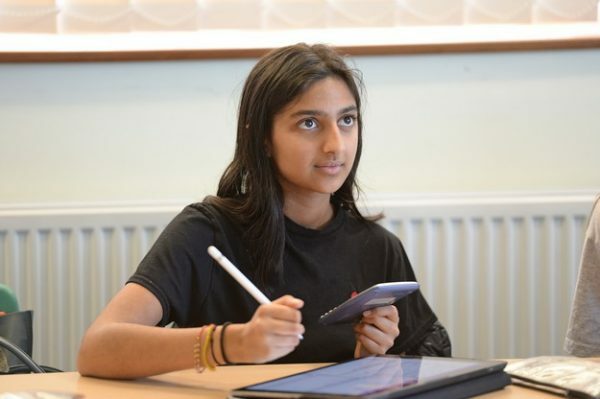 In today’s School, pupils and staff have access to over 350 desktops and nearly 950 devices are used. Initially, only three projectors were installed in 2003, now there are over 60 that enable learning in classrooms and communal spaces. Today, we are lucky to offer pupils the opportunity to learn Computer Aided Design with access to a laser cutter, print and cut machine and a 3D printer in the Physics laboratory. 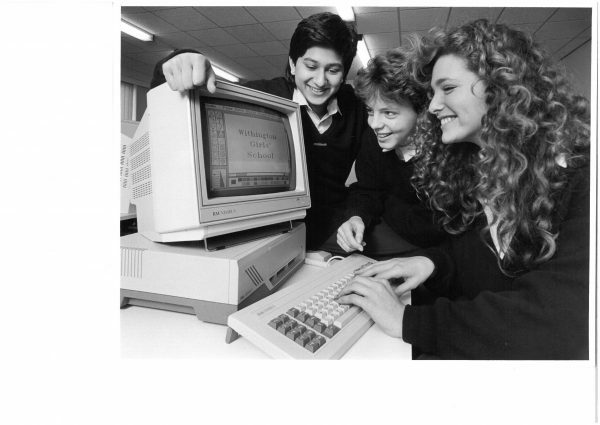 In 1984 the School Society debated ‘This House believes that computers are taking over the world’, these pupils could never have imagined how we would become so reliant on computers and devices!